To maintain availability of products all year round and escape the issue of stock-out, we have established a state-of-the-art warehousing building and incorporated it with the latest inventory control system. The company has uplifted its reputation in the market by offering fine quality Afinitor Tablets at nominal prices. 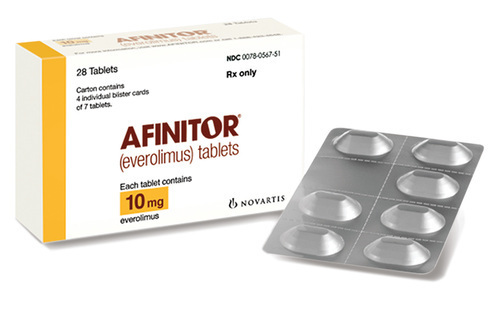 Afinitor everolimus 10mg is used to treat kidney cancer. It is also used to treat certain tumors in the brain. It works by slowing or stopping the growth of cancer cells. Your condition will not improve any faster and the risk of serious side effects may be increased.